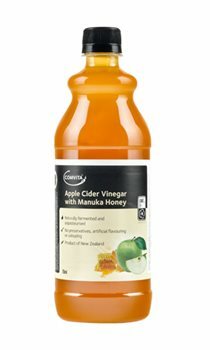 Comvita Apple Cider Vinegar with Manuka Honey is made from sun ripened apples and UMF 5+ Manuka Honey, with New Zealand forest honey added for extra sweetness. This product is not pasteurised and so naturally retains 'mother of vinegar'. As a result you may notice a cloudy appearance. Apple Cider Vinegar (80%), New Zealand forest honey (15%), UMF 5+ Manuka Honey (5%). For a warm drink mix one tablespoon of Comvita Apple Cider Vinegar with Manuka Honey in a glass of warm water. Sweeten with Comvita honey as desired. For a refreshing summer drink mix with cold water, ice and a sprig of mint. Alternatively, use as a salad dressing mixed with olive oil. I'd used ACV before with a little bicarb to help with acid reflux - this makes it a little easier and more palatable by including the honey. Diluted with a little warm water - it works a treat.